While the whole country declared 65000 crores as black money under the government’s Income Declaration Scheme, the top cities in Andhra Pradesh Vijayawada and Vizag, declared around Rs.1350 crores under IDS. Vizag zone topped in Andhra Pradesh in the declaration of unaccounted money. Vizag region having its jurisdiction from Srikakulam to Kakinada had declarations of approximately Rs.750 crore, with 1800 declarations. 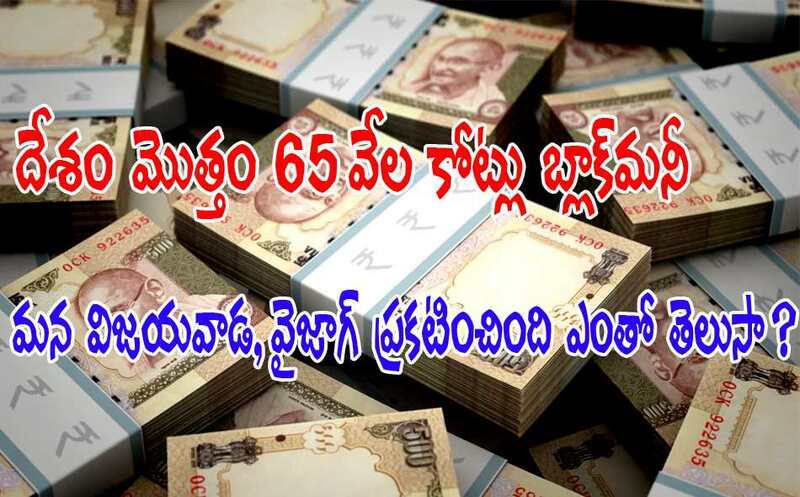 Meanwhile in Vijayawada region the declarations where upto Rs.600 crore. IT Department said that, still there are around 10000 persons in the state, who are not disclosing the unaccounted money of around 1,000 crores. An individual in Hyderabad came with a declaration of Rs 10,000 crore which is the biggest and Mumbai has reportedly disclosed around Rs 8,500 crore, Delhi at around Rs 7,000 crore and Pune at about Rs 4,000 crore.